Let me begin with saying that if you are reading this review, you probably have played Final Fantasy VII or at least know the basic story of the game as Last Order is not a show that you will randomly watch. You really need to know the story behind the game in order to fully appreciate what the people at Square-Enix did with Last Order. Last Order basically gives the gamer what they have wondered since seeing the flashback in the basement of the Nibelheim Mansion - what exactly is the history behind Zack and how does he fit into the grand scheme of things. If you paid attention to all of the minute details in the game, you can get a decent idea of who Zack exactly is and what his role is. Last Order tells us that story and Zack's relationship with Cloud and Sephiroth and how Cloud ended up with Zack's buster sword. The animation is flawless when you consider that they needed to convert all of the Final Fantasy VII world into an animation. It's a completely different project that what Advent Children was about because that was computer graphics, not anime. Cloud, Zack, Sephiroth and the members of ShinRa are all drawn very well, pretty much to perfection. The music is done very well and the voice actors they gave to each of the main characters seem to fit them quite well. My only qualm with it is the music selection. Don't get me wrong, the music was great. But I feel they should have used some of the music from the game to capture the real essence of FFVII. Because its approximately only a 30-minute show, its hard to judge anything about character development. BUT, it does do a great job showing the relationship between Zack and Cloud and exactly the closeness of their friendship. The show also does well in portraying how the ShinRa wanted to capture Zack and Cloud at all costs. Overall, this 30-minute show will answer many questions and leave viewers with a satisfied feeling as they witness the background story of Zack and his relationship with everyone. The big battle scene between Zack and Sephiroth is amazing and showcases Zack's skills very well. This is especially the case when Zack and Cloud are on the run and its Zack vs. the entire ShinRa soldiers at one point. Manga or Anime or Both? : Anime alone, as far as I'm aware, released with the Collector's Edition in the US, and the Ultimate Edition in Japan. 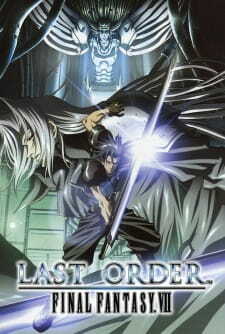 Story: Last Order cuts between flashbacks to the Nibelheim Incident, Zack's escape from the lab with Cloud five years later, and ShinRa and the Turks' pursuit of the former. Story Critique: ...Honestly, it's not what I was expecting. I knew that it covered the Nibelheim Incident and it's aftermath, but still. They didn't even cover anything before Sephiroth goes crazy and burns down/slaughters Nibelheim. I was really looking forward to that. (pouts) Decent rehash of things already covered in the game, for the most part. As for the Zack/Cloud escape... for the most part, it's gratuitous action scenes, peppered with Zack conversing with a comatose Cloud. The only part I really liked about that part of the plot was the last five minutes, and anything to do with the Turks. Tseng was mostly used as a plot device in that he prefaced all the flashbacks with a mini-monologue about it. That was about the best transitioning that they did; for the most part, the transitions are abrupt, and disorienting. Art Style: Studio Madhouse did the animation for Last Order; I'm not sure what other series they've done. EDIT: Madhouse's credits include Paranoia Agent and, as of late, Death Note. All in all, I'm happy with the art style for this. Beautiful 2D animation, and decent CG. The CG seems awkward when it's in the same scene as 2D, though; it has to be either one or the other. Music: Your typical rock soundtrack, with some techno and strings thrown in the background. Not all that impressed. Voice Seiyuu: I was too lazy to check the credits, but, from what I heard, I'm pretty sure that any voices that S-E's used in previous VII titles (Advent Children, Dirge of Cerberus, possibly Before Crisis) were used in this title as well. Length: Last Order clocks in at just under a half-hour, including credits; about the length of your typical anime episode. I'm not all that satisfied with it; I was expecting something a little... I don't know, longer than this. Fourty-five minutes at the least, maybe closer to an hour. Overall: Beautiful animation, excellent seiyuu. They still need work on the story, music, and run time though. It's worth a watch on YouTube; I wouldn't go and buy the Japanese special edition of AC just to get this, though. First off I have given this anime a 5 due to it being (for the most part) a recap of a portion of the FFVII storyline. Just to reiterate: if you have played FFVII and remember all information relating to the whole 5 years ago incidents at Nibelheim then I think you will agree with me when I say this anime is (to an extent) Square Enix's attempt at milking FFVII. Now I am huge fan of the Final Fantasy games having played them all through numerous times, VII included, but in all honesty all the new content you get from this anime is a couple of new scenes of Zack slicing through some members of Shinra, then get injured himself, you will also see Cloud get stabbed once more than I remember in the game, otherwise you will have already have got all of this anime has to offer by playing FFVII on the Playstation. Story: Yes the story originally was excellent in FFVII, but I'll say again, this is more or less just a recap, hardly anything new other than some action scenes, it's not worth more than the 5 average rating I have given it. Art: This anime looked nice enough, but in all honesty I have seen better and have come to expect something a little more from Square Enix. Just take a look at FFVII - AC, it came out the same year and the art and animation are MUCH better. Sound: There's a few of Uematsu Nobuo's classics thrown in which, if you're a fan of the original game like me you'll find leave you with a slight feeling of nostalgia, prompting you to remember the awesome game. Other than the Uematsu stuff, the music isn't anything special but it's good enough. Character: The anime's heavily focused on Zack, who yeah, if you like him could be an entertaining enough character, but we don't really get enough time to really develop any connection to the characters here. The appearance of Tifa and Cloud along with Tifa's mentor/ master will again leave you with that nostaligic feeling, but - here I go again - have you played FFVII you'll have seen this all before, so you know what to expect, the characters themselves are great but with so little time nothing has any real chance to develop. Enjoyment: Average because I'd seen it all before. In short: This is one for the fans, and even then it's not anything to scream and shout about. If you like action, want something quick to watch (20 mins without the credits) then go for, but don't expect too much. As we wait for the next installment in the acclaimed Final Fantasy series, there is no better time then to see what wonderful figures have been released during the franchise's long run.